Christmas time comes so quickly every year. And every year I am faced with that same question: "What to give my family and friends for Christmas?" 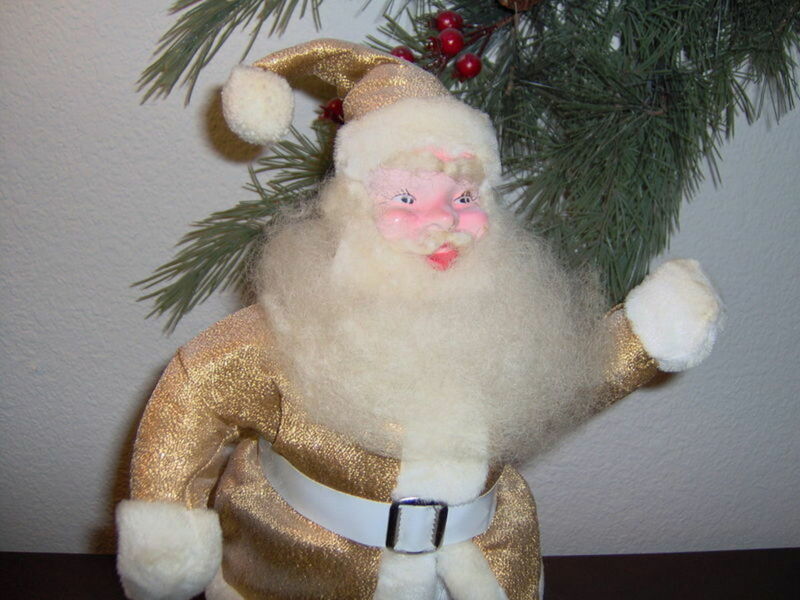 Then I discovered a beautiful gift-giving idea on eBay. 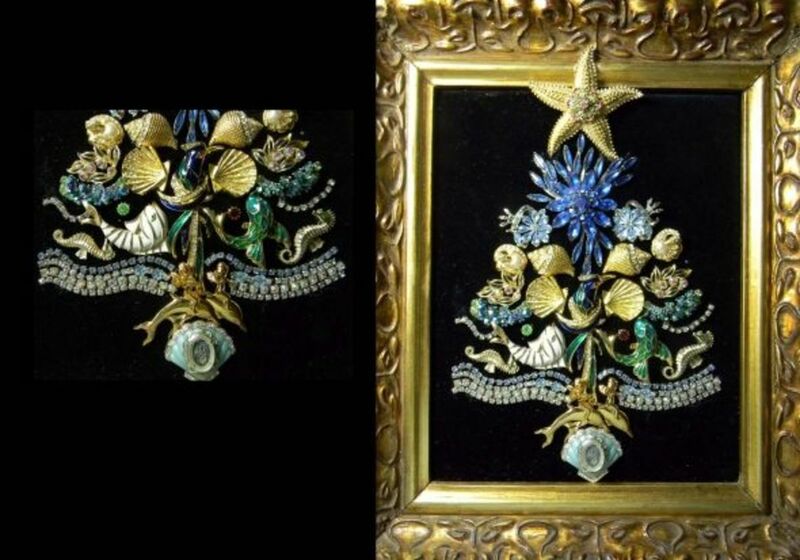 Absolutely beautiful costume jewelry was used to form christmas tree shapes and then beautifully framed. When I saw these for the first time, I had to have one, but they were selling for $200 and up. Now you must know that I am a huge fan of shopping at estate sales, flea markets, and garage sales. I had collected bags of beautiful costume jewelry. Some I sell on eBay, some I pin on a special pillow, and some I wear. And then there are the broken beauties that I was always planning to repair. So, I tried making one and shared it with friends. I was surprised at the reaction. Everyone loved it! I want to share these lovely beauties with you here. If you like the idea you can make them too. Now is the best time to begin. The art featured here was my first costume jewelry tree. I took an old picture frame, which is actually small, measuring 4" x 4." I used scraps of velvet fabric and gold ribbon and a pile of broken jewelry. I cut foam core board to the size of the frame and wrapped it in velvet. I ran the ribbon up one side and down the other making a loop at the top; then gluing the velvety covered foam core and frame together, sandwiching the ribbon in between. Then I laid out my jewels in the shape of a tree. As you see here, I didn't stay within the window frame. It made a charming christmas tree ornament. This piece was made especially for my mother. She is very simplistic and elegant. I wasn't sure if she was going to like this concept since she is a no-fuss kind of lady. Everything in her home is streamlined. To express her sense of design, I used minimal gems to form the shapes. The bottom "branches" that spread out are matching rhinestone earrings. All the jewelry used in this tree is from the 20's to the 40's. Many of these pieces belonged to her mother and were sent to me by her younger sister. The frame is an 1880 oak which I painted gold and silver with a deeper gold for the subtle details. 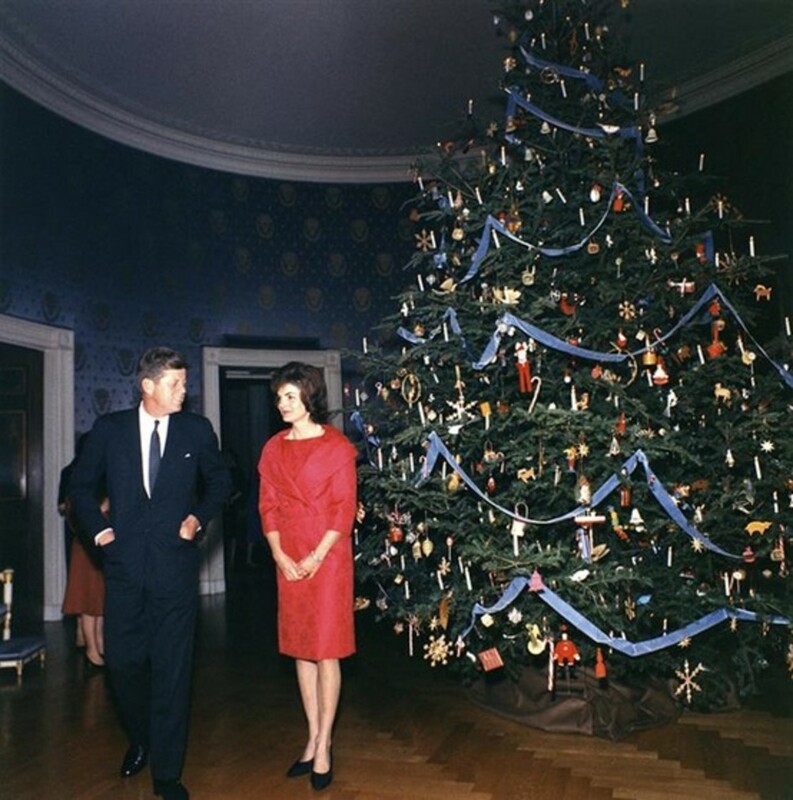 The frame measures 14" x 17" while the tree measures 7" x 10.5". She was so in love with this piece that she keeps it out on her fireplace mantel all year. The beauty of this can't be shown in a photograph. The gems catch the light from all angles and sparkles with splendor! 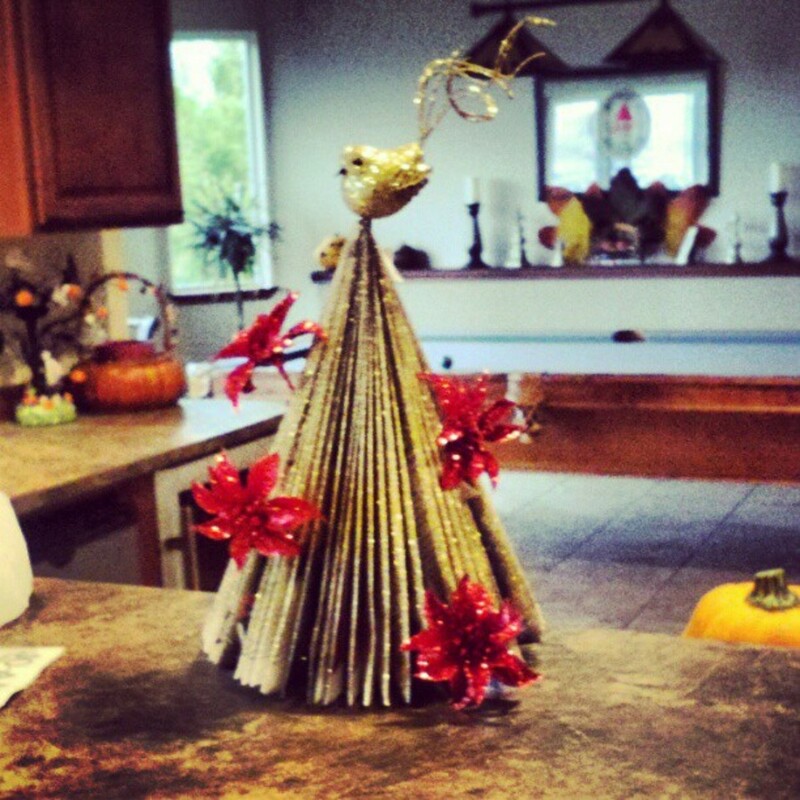 This was one of my favorite Christmas jewelry trees. I made this one for my oldest daughter and her finance. Both grew up in Rochester, NY and are now living in Florida. They both love dolphins, shells, fish, and birds, so I focused my hunt on those types of jewelry pieces. 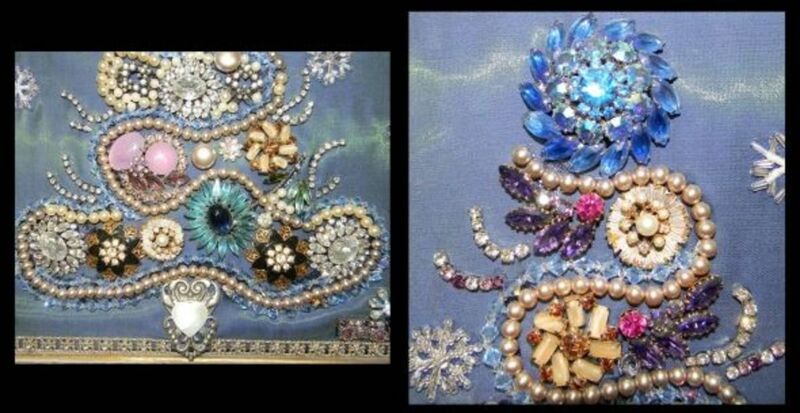 There is only one very old brooch on this piece and that is the large blue rhinestone at the near top. There were stones missing so I snipped off the "stem" with the missing stones. When designing the costume jewelry tree begin the process by thinking of a tree topper, central focal point, and asymmetrical sides. Perfect symmetry is very difficult to do if you do not have two of every piece of jewelry. I like to use earrings to help build some sense of symmetry. I do, however, think the asymmetry lends itself to a more interesting piece of art. Go shopping at estate sales, flea markets, and garage sales. The springtime is the best time to find good deals. Be on the look out for all jewelry. I have found that older costume jewelry is much prettier, structurally stronger, and unfortunately,not always in mint condition. This kind of gem is the best, just be sure to get it at a super low price. 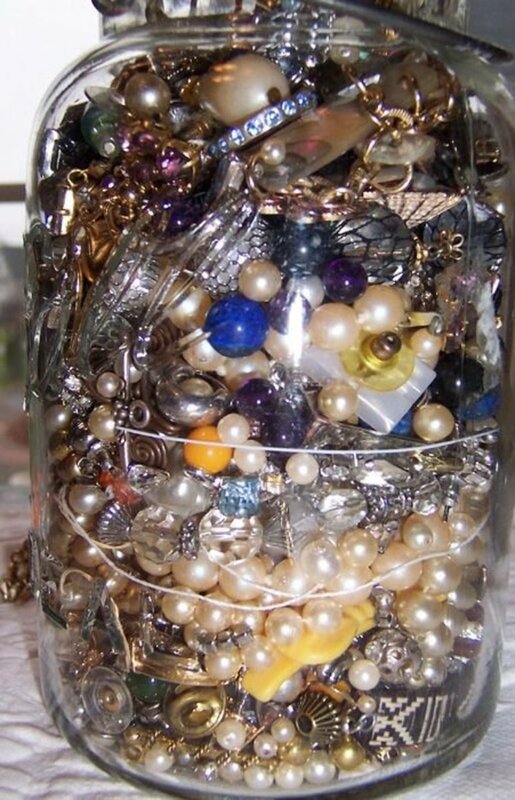 Visit Goodwill, thrift stores, and second hand shops; often theses places will fill jars of broken jewelry and sell the whole jar. EBay is another good source for buying up large quantities of costumes jewelry at reasonably low prices. Another online auction that is a must to check out is www.shopgoodwill.com. And don't forget to check great auntie's or grandma's jewelry box. 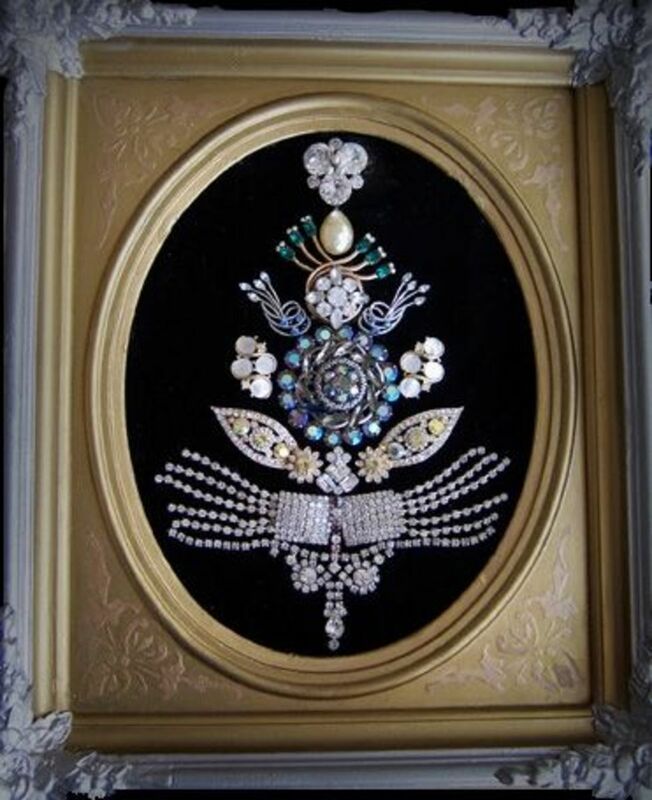 While shopping for jewels, be on the look out for old picture frames. Think in terms of size. Little unique frames make great ornaments. Working too big will take you more hours than you might want to put into your project. 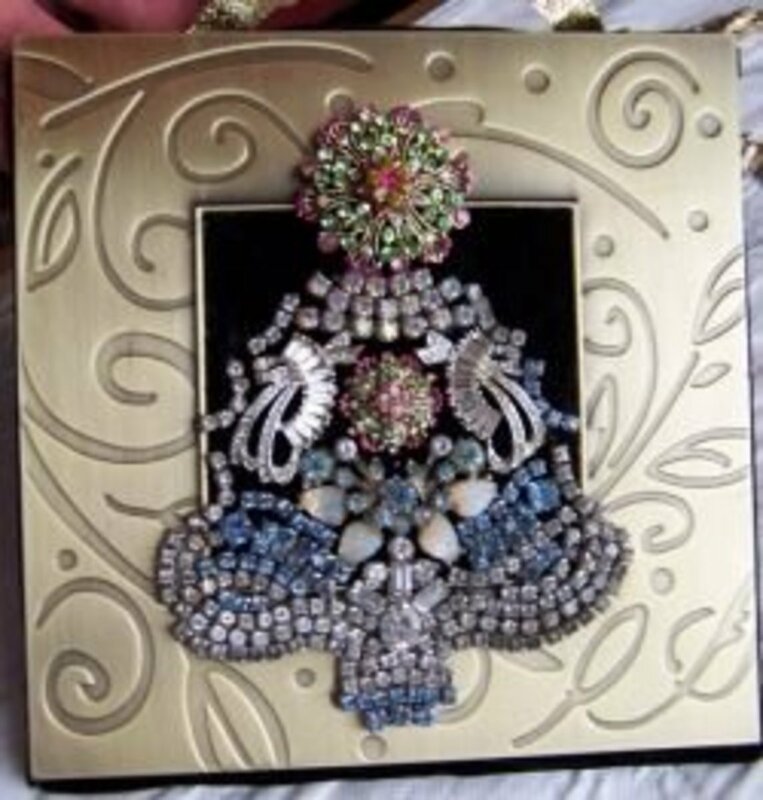 These are my recommendations for what you will need to create a costume jewelry christmas tree framed art piece. The listing here shows the items that I used. These are found on Amazon, however they can also be found at Michael's, some Wal-marts, and hardware stores. Best combination of tools for cutting jewelry, positioning stones, and placing jewelry in position. These are a must when working with jewelry. For the cat lover, this tree is filled with cats. This one was fun hunting for cat brooches. I wanted the inside of this tree to "dance" so I used the rhinestone strands to curl in and out. I also snaked a strand of faux pearls like garland on a tree to help move the eye through to the bottom of the tree. It looks much like a "can you find the cats?" tree. Can you guess how many cats are in this tree? 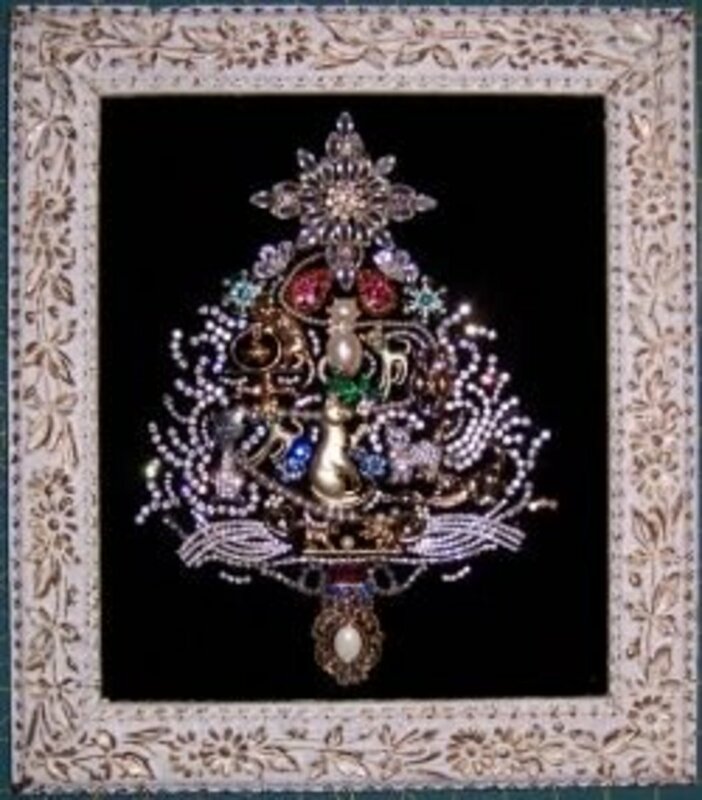 The large crystal brooch on top of this tree is a 1940s brooch that measures 3.5" in diameter. All the cat brooches are from the 80's and 90's except for two that were from the 50's. Those two cats are identical and are not near one another in tree. Many of the pieces I used in this tree are signed by the manufacture or designers. The overall frame measures 12" x 16" and the tree measures 7.5" x 12". I made this tree for my youngest daughter. She loves the bling! This is the largest piece I made. It measures 15" x 15" with the art filling the inside frame 12" x 12". Again, the photo does no justice for the real beauty of this piece. I used a fabric that makes me think of a mermaids tail. It shimmers in blues and greens as you look at the piece from different angles. I used some of the most beautiful gems made by Weiss in the 50's. Most of the jewelry is from the 40's to the 60's. I experimented with different glues on this piece. The best glue I used was the E-6000. It went down thin and dried with no stains and made a permanent tight hold. There are small areas around some stones where I worked with other craft glues that left permanent dark stains. In order for the jewelry to lay as flat as possible it is necessary to clip off all the findings on the backs of each piece. Clip as close to the back surface as possible. I used a tool from the Darice 5 piece set shown below. They look like a scissors; they will cut right through the metals. Be sure to wear safety glasses if you do this. 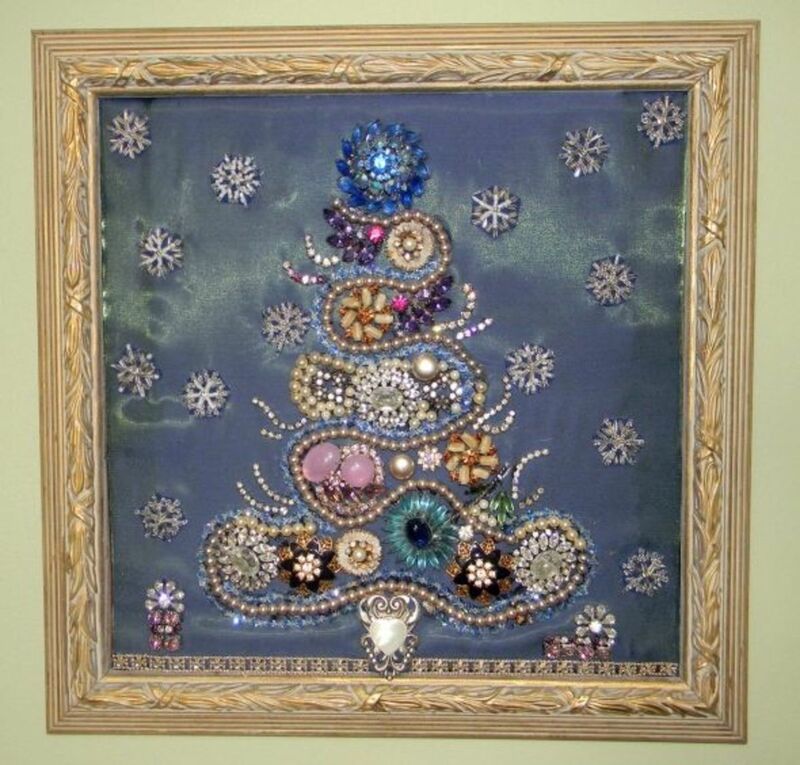 Search for "Jewelry Christmas Tree Framed Art"
If you search for this term on eBay or in Google, you're sure to see what other artist/sellers have created. They sell all year long. Some artist's make crosses, butterflies, and hearts, but all with the same concept of costume jewelry creating the image. I really like this small piece so much that I keep it on a stand on the mantle and at Christmas I put it on the tree. This is an old tintype three dimensional frame. I found it in an antique store and immediately knew what I wanted to put inside it. I found an old aurora borealis necklace, mother-of-pearl pendant and a single earring to put this angel together. This small ornament measures 3.5" x 4.5". It Doesn't Have to be Christmas! I made this piece for Halloween. It is an accent to the "haunted room". It is a tree but when I was finished it looked more like "chaos". That's okay I thought, this feels like halloween ghosts flying in and out. I used old skeleton keys for the branches and many fun halloween brooches. The frame was the best find of all. It is an oak frame from 1850. There is a date on the back. I really liked the fall theme of oak leaves and acorns. I painted it black with silver. This piece worked great! Is it $$$rare or just sentimental? More and more artist's are exploring this art form. There is a lot of old jewelry out there. It is sad to realize that so much of it is not worn or shown any interested in. I use to sell antique jewelry but the sales have dropped considerably. There is so much out there that is rare and special but not many are buying. Do you think artist's should create something new from something old? Meaning old, rare and beautiful jewelry? Should it only be costume? Should artist's destroy old jewelry for the sake of art? Only if it is already broken? I will never wear it. I like to have a beautiful reminder. It does not matter as long as the art will sparkle! I really enjoy the comments. I do read everyone of them. Please let me know if you would ever buy or make a jewelry framed art piece. Hi, What do You Think? Thank you for the tips! 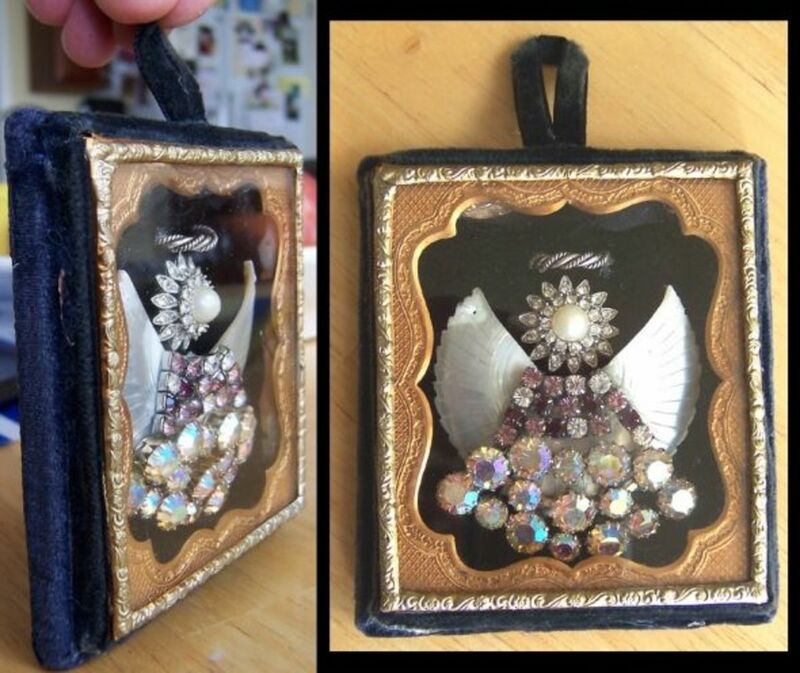 My mother passed away recently and had the most incredible costume jewelry collection ever. I am so excited to see what I can create from it. How beautiful! I saw one hanging in a neighbor's house and asked about it. 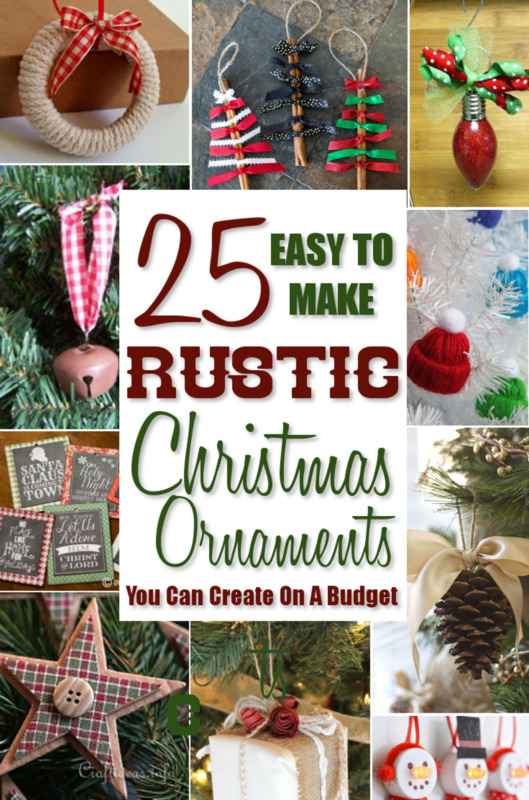 I found your posting while looking up how to make one of these. My aunt passed away a couple years ago, and I have her costume jewelry just sitting in a box. I decided I would use it to make one of these and know it will be a good "memories" piece to put out. She and I used to love the holidays and sharing stories that time of season. I loved your art using the jewelry! You are very talented! I like shiny items and have been buying jewelry on estate web sites for several months...not knowing what to do with them! Thank you for the ideas...might try some! Would help my hand arthritis to use my fingers, good therapy, and making gifts also! Thanks again for this site! Wish you were active on your site more! How did you attach the material to the cardboard backing?? Stunning. I'm going to try this if I ever stop writing long enough to do jewelry crafts again. Your work truly is art. 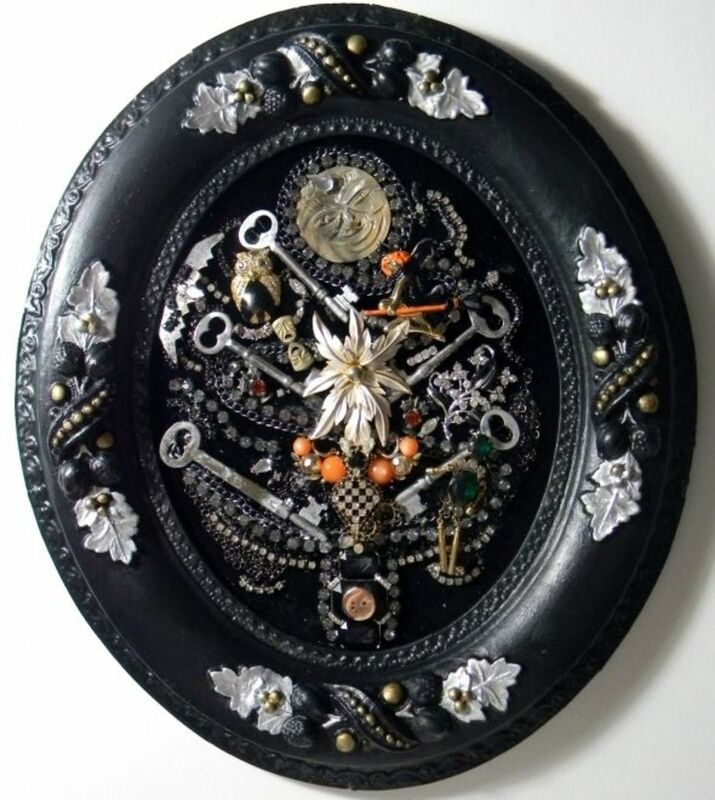 I love old jewelry and in collages with the vintage keys it is gorgeous. I do hope that you checked out the value of the jewelry though before re-purposing it. Some older pieces and name brands can be very valuable in their original state. I really did enjoy seeing your art work. You did a fabulous job on these pieces. Beautiful piece of Christmas art. I have never seen anything like this before. I would never have enough old jewelry to make anything like this, but I would love something like this to enjoy this christmas. Thanks for sharing such a wonderful work of art. I was wondering if you could help me with mine. I tried to make one, but building the pieces up, made it look messy. Any advice would be great. Thank you. Hello There! Do you use a spray adhesive to attach the fabric to the foam core board? Lovely idea and very well presented. Well put together lens, thanks. This is SO pretty! I think I will tell my wife about this. My fav time of year and well put together liked and tweeted thanks for sharing! What a lovely idea! Thanks for sharing - blessed by a SquidAngel! What a clever idea! Beautiful! Very creative, beautiful craft- superbly explained. Blessed. These are gorgeous - I WOOT!!!!!! Stunning art from costume jewelry. I love the ideas you've shared here. 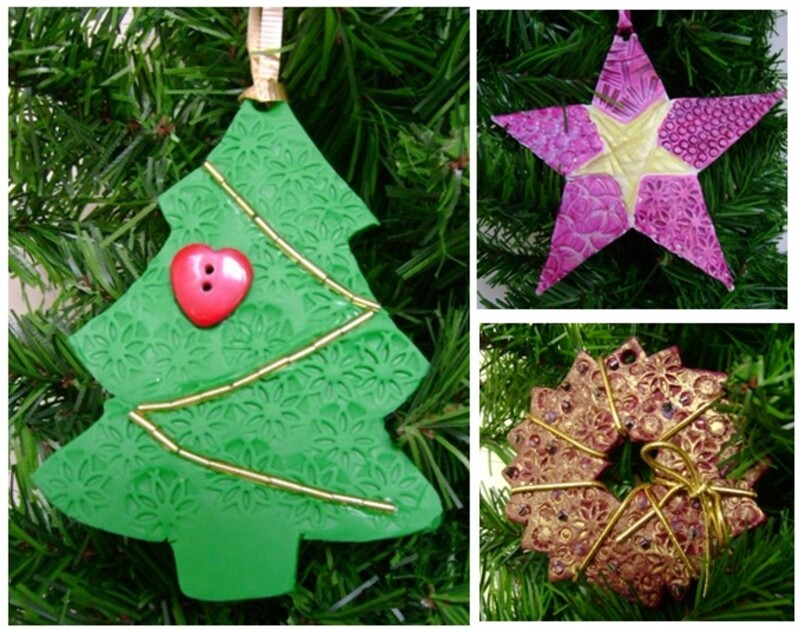 My favorite is the whimsical tree and snowflakes made for your bling-loving daughter. Thank you for giving me an idea for a craft to make my mother's holiday gift. I've never seen jewelry displayed like this before. It looks amazing and I would certainly love to do some myself at some stage. I need to go through my old jewelry now and make one of these. It is so much better than having them languishing in a drawer. Wonderful lens! These are FANTASTIC! Very creative. Thanks for your work! How inspiring --what great ideas! I LOVE the Christmas tree of cats! What fun!! Great article and beautiful product. This is the most creative artwork that I have seen in awhile. Most helpful and inspiring article!! I really enjoyed this. Every piece was unique and different and all beautiful. A really fantastic art form ! I also like the explanations that were given because it makes it very easily a project anyone can do with a little artistic talent and creativity.